Performing golf stretches prior to teeing off is one of the most important parts of your entire round. Many golfers get to the course, check in, take a couple practice swings and let it rip! This is definitely not the right way to start your round! By the time you get properly warmed up, it will be about hole three and a couple bogeys later. 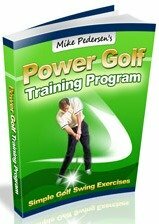 The purpose of this page is to show you a few, quick flexibility exercises that you can perform to loosen up some key muscles prior to teeing off. These flexibility exercises are general in nature and intended to be easily performed while at the course. Two main reasons why you want to warmup prior to starting your round are injury prevention and improved range of motion. Injuries are actually very common in golf and could potentially sideline you for an extended period of time. Muscles that are warmed up can move and work more efficiently which will help cut down on injuries. Improving your range of motion is important because it will allow you to take a larger swing, potentially leading to more power! Key areas that need to be loose are your back, shoulders, and hips. While some of the exercises listed here may be similar to stretches performed at home, there is one huge difference: reduced hold times. For traditional static stretching, holding the stretch position for 30 seconds or greater has been found to provide the best results. However, the problem with this is that research has shown that performing these long hold times immediately prior to performing an athletic event can actually hurt your performance! The long holds actually reduce blood flood to the specific muscles used, making them more prone to injury. These specific warmup exercises are meant to be performed more fluidly, without significant hold. The absolute longest you should hold any of the exercises should be 5 seconds. 1. Trap Stretch - Gently bend your right ear to your right shoulder and hold for about 5 seconds. Repeat for the left side. Perform 3 to each side. 2. Arm Circles - Take both arms and swing them in both small and large circles. Perform them both clockwise and counter clockwise. 10 times each. 3. Huggers - Dynamic stretching for the chest and mid back. These stretches are performed quickly with no hold. To perform the exercise, lift and swing your arms forward and then cross them, essentially giving yourself a hug. Rapidly uncross them, and left them fall back down to your sides and repeat 10 times. 4. Tennis Elbow Stretch - Start with right elbow bent and grab right hand with left and hold into a flexed position (fingers to the ground). Keep wrist in this position and slowly straighten elbow until a stretch is felt in the forearm. Perform three times and hold each 5 seconds. 5. Golfer's Elbow Stretch - Similar to tennis elbow stretch but hold wrist in extended position (fingers to ceiling). Slowly straighten elbow until stretch is felt in forearm. Perform three times and hold each 5 seconds. 6. Trunk Rotation - Take any club and hold in close to your chest, parallel with the ground. Simulate your address stance and rotate at your waist to both sides. Perform 10 times. Another version of a trunk rotation stretch will also help get your legs warmed up. Hold the golf club off to you right side vertically, with the club head resting on the ground. Perform a small lunge with your left leg, and at the same time, rotate your body to the right, helping support yourself with the golf club. Hold for a few seconds and then repeat. Obviously, perform the stretch and lunge to the opposite side as well. 7. Toe Touch/Back Extension - Reach down and touch your toes and then stand back up and arch your back. Repeat 10 times. 8. Squats - Quick golf warmup for the legs. Stand with knees shoulder width apart and perform a squat. One reminder: Stick your rear end out! If you look down while performing a squat, you should still be able to see your toes. If you can't, then you're knees are coming too far forward and you need to use more glutes. Perform 10 times. Nine exercises may seem like a lot, but trust me, performing these golf stretches will help you immensely now and in the future. Also, it may only take you five minutes to perform all of these golf warmup exercises. Do yourself a favor and get to the course a few minutes early and get your body ready to play!